UNITY Alumni Spotlight: Amira Madison – UNITY, Inc.
My name is Amira Madison and I am a member of the Wampanoag Tribe of Gay Head Aquinnah. My tribal community is located on Martha’s Vineyard, a small island off the coast of Massachusetts. I attended University of New Mexico my first year but found myself missing home and family. I transferred to Northeastern University in Boston, Massachusetts. I graduated in 2012 with a B.A. in History and International Affairs. I had also been fulfilling pre-med requirements because NEU didn’t have a pre-med department at the time. I am the granddaughter of the late Medicine Man, Luther Madison of Gay Head Aquinnah and the Great Granddaughter of the late Medicine Man, Napoleon B. Madison. My great great grandmother was the Medicine woman before them. My great grandfather was a whaler at a very young age and traveled the world along with many great uncles from my community. He also opened a restaurant in our town during World War II and it remains one of the oldest family owned restaurants on Martha’s Vineyard. How did you get started with UNITY and how has it impacted your life? I started in my local youth council in 2005. My first conference was in Oklahoma in July of 2007. In 2008 I was elected as female representative at the conference in Reno, Nevada. I took a year off after my first year and ran in San Diego for Secretary in 2010. From 2011-2013 I served as the Female Co-President for UNITY. I was the second Female Co-President to serve from the Northeast. UNITY changed my life and gave me a place to share my untiring personality. It allowed me to learn, grow, and help others. I wouldn’t be the leader I am today if it weren’t for UNITY. Some of my very good friends are those I met at UNITY. It gave me a large family that I know I will have with me in this life. Getting to know people like JR Cook, Russell Coker, and Jeri Brunoe changed my life. I’ve mostly been in office administration and office management. I also have have experience in youth work as I’ve been a mentor and youth coordinator. I’ve done a lot of work in human services/ social services, natural resources, museum administration and tours, and Tribal Historic Preservation. Currently, I’ve just returned home to Boston after living in Oakland, CA for two years. I’m working as administrative assistant. I’m looking into graduate school next year because I’d like to become a therapist. 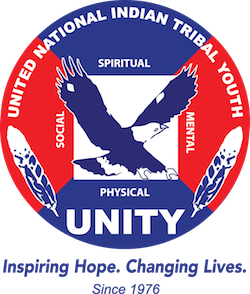 What advice do you have for Native youth? If there’s any advice I can give it’s to enjoy your life. I’ve found that there are many cliches out there but that each of them is a simplistic truth. Life is truly short and you have live it for you. Travel more, eat more, socialize more, just live your life. Don’t get stuck in the norms that society feels we should all live by. People, cultures, languages, food, sports, art, entertainment all have things that we can learn from. Never think that you know everything because that’s not possible! Being the best human being you can be means that you are constantly open to knowledge. Keep your mind and heart open to the endless possibilities that life has to offer. Plans and goals are great but don’t be too set on how you get there. Trust me when I say that nothing ever goes as planned. Nothing is simply black and white, there really are shades of grey. Best of all, be confident in being an individual. We are uniquely ourselves for a reason so be proud of that and never conform to things around you to fit in. It’s okay to be alone and you’ll find the strength in being you. What does living a balanced life mean to you? Living in balance in the four core areas (spiritual, mental, social and physical) is the basis for a happy human being. It’s so important for me to balance those things to live each day with peace and happiness. Thank you Amira for taking the time to answer our questions and thank you for being a role model and community leader. We love our UNITY Alumni!